A research thrust leader's work doesn't stop when the strategic plan is formulated; that's only the beginning, a prelude to the real effort. Constant follow-up is necessary (e.g., continually checking progress and resource expenditures against the plan). Also, as noted earlier, research thrust leaders have to be willing to make adjustments to the plan if necessary—especially with respect to budgets, resource allocations, and schedules. Below (sections 3.3.2–3.3.6) are five pragmatic approaches and one important open issue (section 3.3.7) for research thrust leaders charged with executing their strategic plans. 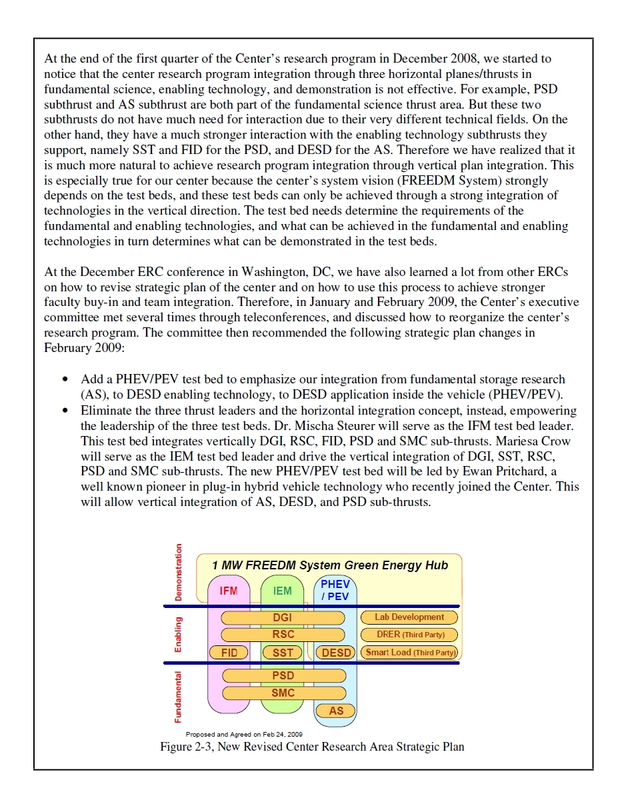 The goal here is to show how a particular thrust fits into the overall strategic plan of the ERC and to convince thrust members of the importance of their roles in fulfilling the center’s larger vision and mission. To an extent, some buy-in may have occurred during preparation of the strategic plan. However, that buy-in may only be transitory as the real work gets underway and the relevance of a particular project to a distant vision or mission dims in the minds of participants. Accordingly, the research thrust leader must constantly reinforce the relevance to the ERC’s goals and the consequent need for buy-in as the projects continue. Budget and resource allocation issues must be part of this best practice (e.g., what dollar and human resources will be allocated, and when?). Ideally, research thrust leaders should participate in the center-level budget and resource-allocation processes and have a clear understanding of budgetary and resource-allocation responsibilities and authorities, from the top of the ERC downward. However, the extent to which this is possible depends on the ERC and university leadership. In any event, research thrust leaders must communicate clearly and often with the ERC director, colleagues, and subordinates about budgets and resource allocations. Critical path chains should be optimized to achieve the most efficient timelines, bearing in mind that some fundamental challenges may take time to resolve. Further, although interactions among team members are to be encouraged, extraneous interaction should be avoided so as to not complicate each critical path with unimportant connections. The project goals can be accomplished without all players in the thrust being engaged with every aspect of the work. In addition, the thrust leader should ensure there is no overlap in deliverables, such as two research efforts producing the same results. Coordination of deliverables between thrusts is also important. To illustrate the last point, there might be a situation in which a research thrust leader has to decide how to keep a research team productive when waiting for a deliverable from another thrust. Alternatively, a thrust leader may be faced with developing workarounds when an outside deliverable fails to materialize. A best practice would be to request every project to have a Plan B if Plan A, which reflects input from another thrust, has a schedule slip or doesn’t happen at all. Continuous and effective communications, both up and down the chain of command, are essential. With respect to levels of management above the thrust leader, communications must be clear, convincing, and concise. For levels parallel or below, in some cases research thrust leaders may need to rely on persuasion. Direct orders to other thrust leaders or independent researchers are likely to be seen as abrasive and fail. Define the goals and milestones as a team. Use video-conferencing and web-based communication systems. Establish regular schedules for meetings. Record minutes for key meetings and decisions. Always communicate with principal investigators and project leaders. Don’t forget the telephone or face-to-face communications—an e-mail can be misunderstood. Push to attend and interact at national meetings and professional society meetings (where ERC budgets permit). Schedule retreats for university students to show or present their work. Metrics that measure progress and accomplishments. Consideration here of meetings extends the preceding discussion of communications. Weekly or bi-weekly project meetings would be desirable, if possible, as would monthly meetings with center executives. However, a proper balance needs to be struck between meeting and doing. In other words, are the meetings worth the time spent? Meetings that involve thrusts across several universities are also challenging from travel and time standpoints. On reports, research thrust leaders should establish and disseminate reporting schedules for interim progress, outcomes, and other deliverables. Monthly reports from individual researchers to thrust leaders along with quarterly reports from thrust leaders to higher levels of ERC management are probably sufficient. Caution should be taken to not overly burden the individual researchers who furnish inputs for such reports (i.e., they should not be too distracted from doing their projects). An online system might work well here. Metrics for assessing performance are essential. As discussed in the previous section on strategic planning, the correct choice of metrics is very important. Much preferred are metrics that measure outputs and outcomes rather than inputs. It may not be possible to develop during strategic planning a complete set of worthwhile metrics, so research thrust leaders might be faced with this task during the execution phase. NSF’s requirements for center metrics, in the context of both annual reporting and on-site reviews, must be taken into account here. The center’s Administrative Director/Manager is likely to be the most cognizant staff member regarding these requirements, and should be consulted. to adjust the metrics if a situation warrants. The project assessments would also be used to support recommendations for adjustments in budgets or resource allocations. Know and take account of backgrounds and capabilities of collaborators in the ERC. Develop and articulate a conflict-resolution strategy that everyone is likely to buy into. Thrust leaders have to set research direction, so if people disagree on that direction an issue is raised on how to reach resolution. Depending on the issue, third party input (e.g., from some type of scientific advisory board or other technically savvy authority) can help resolve the matter. But clear articulation of the issue and what is done to reach agreement is important. Note that possibly more contentious disagreements could arise on budgetary and resource allocations (see earlier discussion). Here the best practice would be to discuss the matter openly with participants in the team as well as other thrust leaders to gather information about various options for handling the situation. Then put it on an agenda for discussion with decision-makers in the ERC’s leadership team. Finally, uncomfortable personality conflicts might emerge between individuals at various levels. If these cannot be worked out by face-to-face dialog, one suggestion is to consider bringing in a conflict-resolution expert. At a certain point, such conflicts become a matter for center leadership to address. Thrust leaders expend much time and energy on their leadership tasks. Other than an occasional “good-job” recognition from ERC management, their management work is not compensated. Should these leaders have some type of more tangible compensation for their important responsibilities? Several best practices are suggested below, but these are ultimately dependent on the ways individual ERCs and universities operate. Extra pay or vacation are at the top of the list of possible types of compensation for at least some of the considerable time and effort spent by thrust leaders to carry out their responsibilities associated with the ERC (e.g., through summer support or regular-year effort). It is useful to see examples of improvements that were made when strategic plans were being implemented. The first example below shows how fundamental elements of a strategic plan had to be modified based on lessons learned during implementation. (This experience also feeds back to Section 3.2, which contains a best practice of defining a structure that can accommodate adjustments.) The remaining examples, from ERC strategic plans described in subsection 3.2.7, show selected responses to various suggestions made by visiting reviewers after observing aspects of the implementation. The example shown in Exhibit 3.3.8.1 starts with the original relationship between the planes of the diagram; it then explains why that relationship had to be changed. The example also illustrates this ERC’s approach, after discussions with other ERCs, to achieving stronger faculty buy-in and team integration. 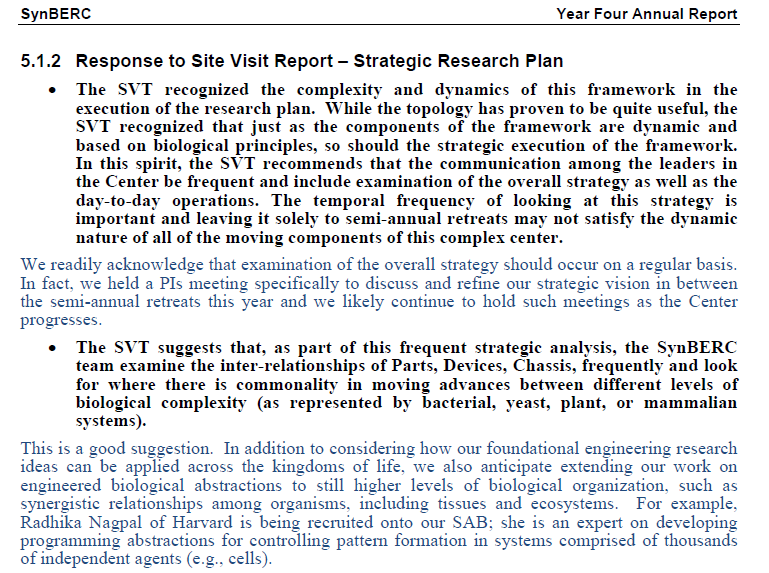 The following example, responding to comments from a Site Visit Team (SVT) relates to best practices in the areas of communications and interactions that could identify commonalities. Here the example (Exhibit 3.3.8.3) illustrates the need to ensure that all elements of the team continue collaborating and working together in a coordinated fashion. 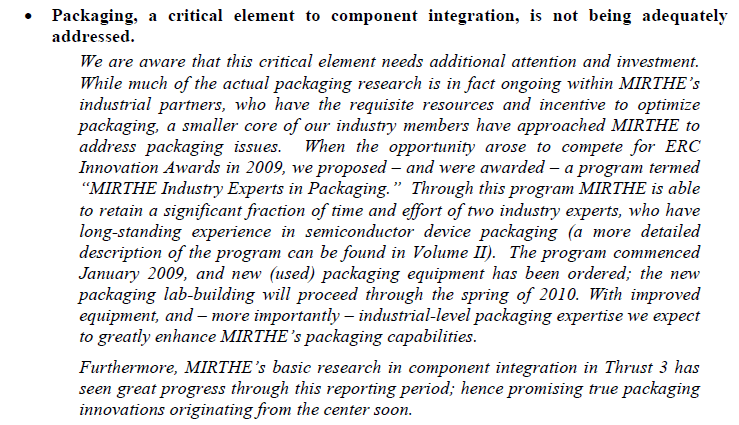 In this example (Exhibit 3.3.8.4) it was learned that changes had to be made to include more attention and investment so that one important element of research (in this case, packaging) could be addressed adequately. 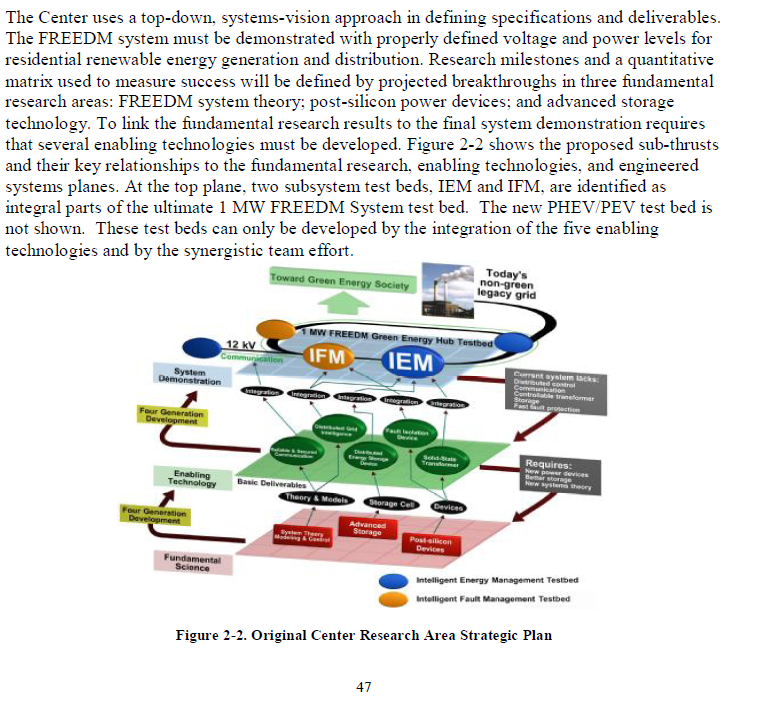 This last example (Exhibit 3.3.8.5) reveals that a site visit team discovered that achieving the center’s system-level goals would not be possible without further advances in component-level technologies. 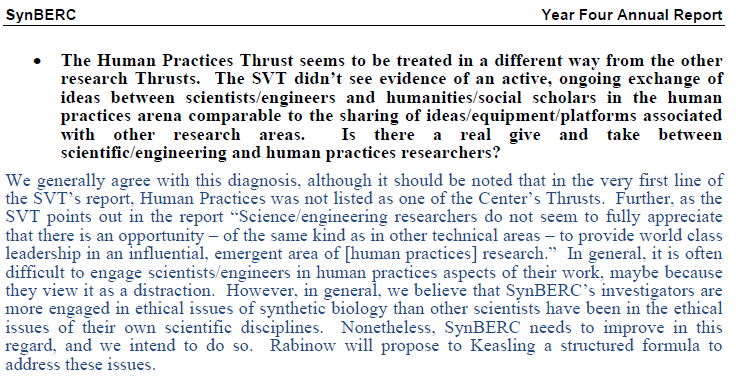 One element of the response was to continue bringing new faculty into the center to provide needed expertise. The earlier that monitoring of progress during implementation (a best practice) can identify shortfalls such as this, the earlier that corrective actions can be put into place.